The Forest Governance Project, financed by the European Union, is developed in Belize, Guatemala, Honduras and Nicaragua, by a consortium of indigenous and community based organizations led by ICCO. In the Honduran regions of Olancho, Comayagua, Gracias a Dios and Choluteca, it is implemented with the support of FEPROAH, to strengthen operational capacities of agroforestry communities and their effective involvement in forest governance and sustainable management. 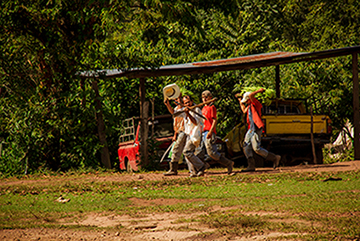 The Federation of Agroforestry Producers of Honduras (FEPROAH) is a community association that has 49 affiliated organizations, including agroforestry cooperatives located in the departments of Olancho, Gracias a Dios, Comayagua, Francisco Morazan, Yoro, El Paraiso, Santa Barbara, Atlantida and Choluteca. FEPROAH has more than 15 years of experience defending the rights of forest communities and has developed exemplary self-management and sustainable forest management processes, which have been recognized internationally. From community forestry companies, these organizations have generated experiences of wood production with direct socio-economic benefits for the communities, while simultaneously achieving environmental objectives, such as forest conservation, landscape restoration and watershed protection, among others. FEPROAH has assumed a key role in the expansion of rights, through participation and dialogue in various processes, such as the Forestry Law of 2007 that established a new mechanism for the recognition of community rights. As a representative of grassroots agroforestry production organizations, political advocacy is one of the main functions of FEPROAH. It is a key player actively participating in national forest governance processes such as VPA FLEGT, the National REDD plus Strategy, the National Strategy for the Restoration of Productive Landscapes. The action seeks to consolidate decision-making dynamics and governance measures based on inclusive dialogue, respect for the rights of Indigenous Peoples and responsiveness of state authorities. This opening of dialogue and democratization of decision-making will allow the effective fulfillment of a legal framework that already exists, but which application is historically limited by the lack of recognition of indigenous communities as subjects of law. Increased capacities of indigenous authorities and organizations, as well as of forest, peasant and fishing communities will have a direct impact on biodiversity conservation and restoration, sustainable management and protection of Mesoamerican forests.